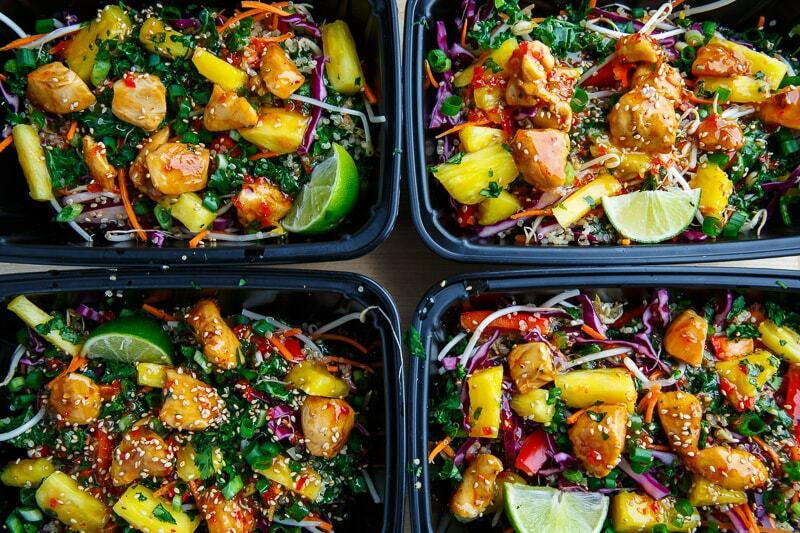 A sweet, spicy, and tangy quinoa bowl with sweet chili chicken, pineapple and plenty of veggies! 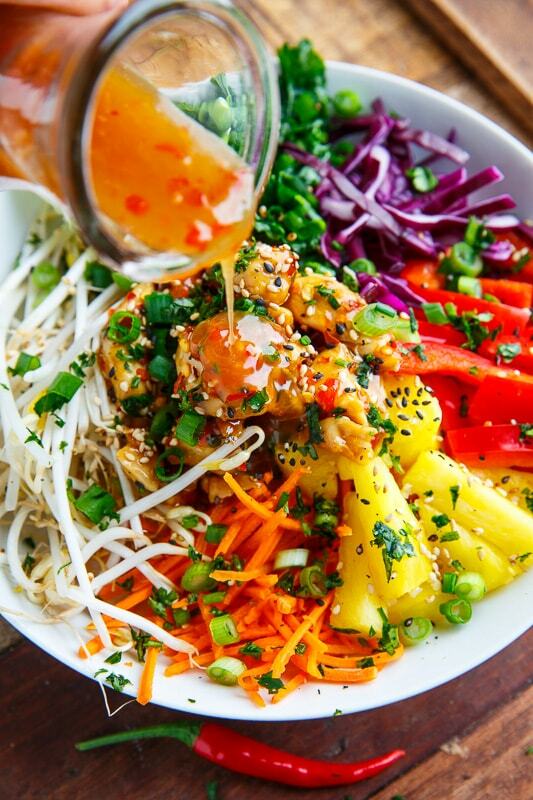 I have been into one-bowl meals lately (ones that I can make ahead of time are the best) and these sweet chili chicken buddha bowls are a great option! 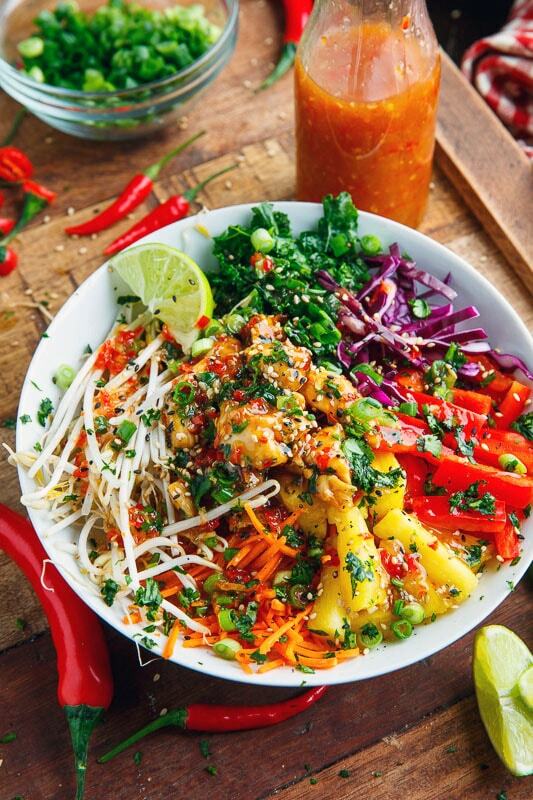 Really the options are endless where you start with a base such as quinoa, rice, noodles, etc, add a protein such as chicken, beef, tofu, beans, add some veggies and/or fruits, a dressing and optional garnishes such as herbs, nuts, cheese, etc. and you have a tasty meal all in one bowl! 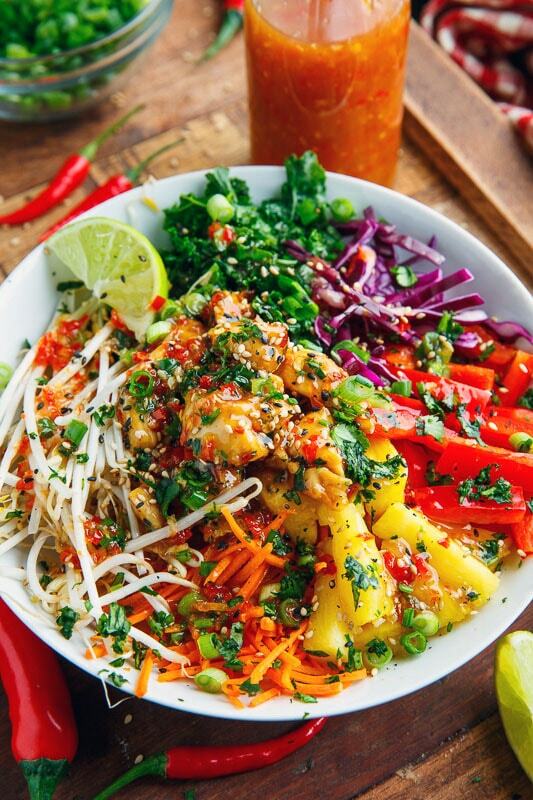 For these sweet chili chicken bowls I have a base of quinoa to which I add massaged kale, beans sprouts, carrots, cabbage, bell peppers, pineapple and chicken with sweet chili dressing! Yum! 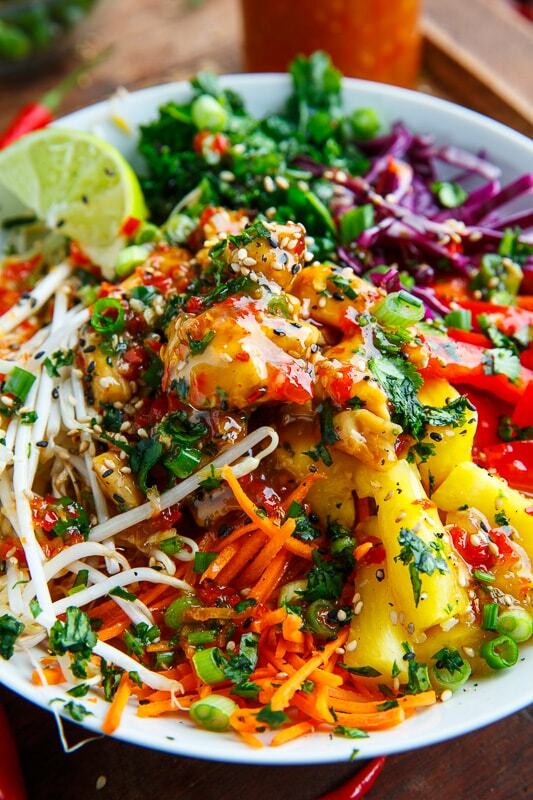 That sweet chili dressing goes so magically well with the juicy pineapple and bell peppers creating an amazing meal that is light, healthy and satisfying! 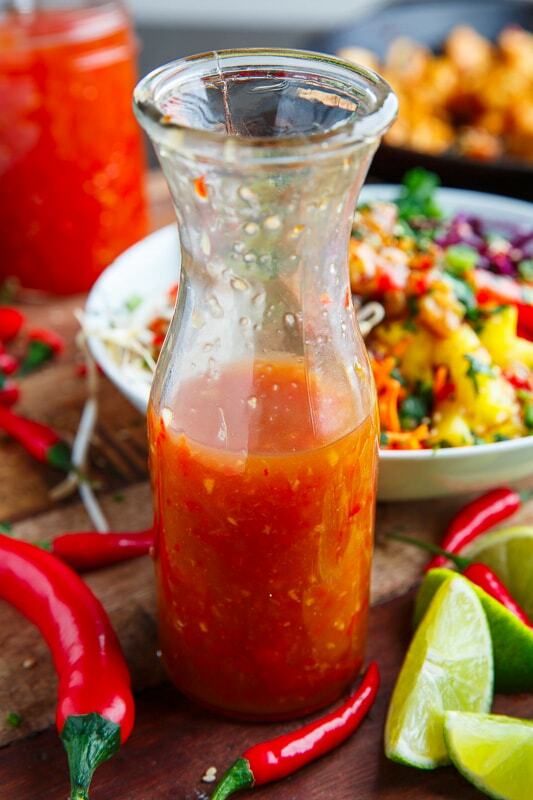 What a tasty sweet chili dressing! Perfect for Meal Prep for quick weekday meals! Bring the water and quinoa to a boil, reduce the heat and simmer, covered, until the quinoa is tender and has absorbed the water, about 15-20 minutes, remove from heat and let sit for 5 minutes, covered, before letting cool. Meanwhile, assemble salad and enjoy! Option: Use skillet sweet chili chicken! Tip: Make the quinoa a day ahead of time so that it is cool when assembling the salad. Note: Massage the kale with your fingers until it turns a nice deep dark green, optionally adding 1 teaspoon oil, 1 teaspoon lemon juice and a pinch of salt to help speed up the process. Option: Add a sliced avocado! Option: Replace the quinoa, with rice, other whole grains, noodles, etc. Wondering if the nutritional information include the chile sauce? Where do you put the 1 3/4 c up of coconut milk? You can cook the quinoa in water or coconut milk, which will flavor the quinoa an add a nice fragrance. Made this tonight and it was yummy! My husband and 8year old loved it. It will be something we can eat off of for a couple days.